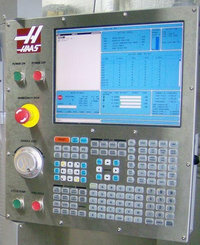 0 HS SERIES CNC – Set to one for HS series mills; set to zero for all other mills. 1 RESET STOPS TL CHGR – Tool changer can be stopped with Reset button. 2 CHAIN TOOL CHANGER – On all HS mills with the 60 or 120 pocket chain-style tool changer, it must be set to 1. On all other mills, it must be set to zero. 3 ENABLE CHIP CONVEYR – Enables chip conveyor, if machine is so equipped. 4 50% RAPID KEYBOARD – When (1) the control will support the 50% rapid traverse key. For controls without a 50% rapid keypad set this bit to (0). 5 FRONT DOOR – When enabled, control looks for additional door switch and generates operator message. 6 NO Z HOME IN TL CHG – Horizontal mills only. Prevents Z-axis motion to machine zero prior to tool change. 7 M36 AUTO PAL ROTATE – Horizontal only. When set to (1), an M36 rotates the A-axis after the Part Ready button is pressed. 8 AUX AXIS TL CHANGER – Horizontal mills only. When enabled, means the tool changer carousel is driven by an aux. axis. 9 SPIGOT KEY INVERT – Controls the direction the spigot moves when the Coolant Up and Coolant Down buttons are pressed. Changing this bit reverses the direction the spigot moves when the buttons are pressed. It has no effect on the direction the spigot moves when commanded by the M34 and M35 codes. 12 REVERSE CONVEYOR – Reverses the direction of the chip conveyor. 13 PRE-ORIENT TAP – When this parameter bit is set to 1, a spindle orient command is issued automatically prior to the repeat rigid tap function. 15 GREEN BEACON – When (1) user relay M25 is used to flash a beacon. If the control is in a reset state, the beacon will be off. If the control is running normally, the beacon will be steadily on. If the control is in a M00, M01, M02, M30 feedhold, or single block state, the beacon will flash. 16 RED BEACON – When (1) user relay M26 is used to flash a beacon. The beacon flashes if the control is experiencing an alarm or emergency stop condition. 18 DISABLE COOLANT IN – If set to 1, low coolant input will not be used. 20 REMOTE TOOL RELEASE – If set to 1, allows use of remote tool release button on spindle head. 21 FLOPPY ENABLE – If set to 1, enables the optional disk drive. 22 TL CHG RECOV KEYPAD – If set to 1, enables tool changer restore button on keypad. 24 TSC ENABLE – When set to 1, DSBL CLNT IN bit is ignored, M24, M54, and M64 are disabled, and TSC will operate. When set to zero, the control functions normally. 25 AUX JOG NACC – If the jog handle is moved rapidly, the auxiliary axis will not develope extremely large lags. 26 ALIAS M PROGR START – Alias M codes during program restart. 27 DISABLE JOG TEST – Disables the encoder test for the jog handle. 28 NO ZERO CLAMP – During zero return of pallet changer, the general sequence is 1) lift, 2) home, 3) lower. When this bit is set to 1, only the first two steps are executed. The pallet remains in the unclamp position. This bit was added to prevent damage to the pallet changer prior to Grid Offset and Tool Change Offset (zero return offset for the pallet changer axis) set up. 29 PAL READY BUTTON – Accommodates both APC on vertical mill and Rotary Pallet Changer on Horizontal mill. This bit should be set to 1 on 2-pallet APC’s to designate a single pallet button configuration. Four pallet APC’s have a 2 schedule pallet button and should have this bit set to zero. This bit should be zero on Horizontal Mills, since it is intended for future pallet changer software that replaces the macro program. 31 SPINDLE NOWAIT – When (1), the machine will not wait for the spindle to come up to speed immediately after an M03 or M04 command. Instead, it checks and/or waits for it to come up to speed immediately before the next interpolated motion is initiated. This bit does not affect rigid tapping or the TSC option.